I used to be SKINNY, but no longer I’m afraid. In my better days, at five feet six and 110lbs. 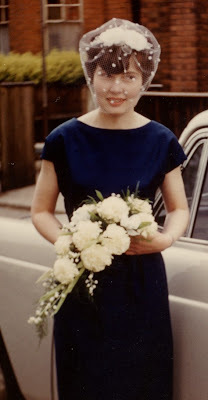 On my wedding day in London, almost 47 years ago. A print made from a slide and scanned, so pretty poor quality. Ah youth, gone but not forgotten! However, I occasionally drink a SKINNY caffè latte, although mostly I drink rooibos or South African red tea, full of antioxidants so they say.